December 03 – Grand trine in Water signs; Chiron in Pisces, – True Node in Cancer – and Mercury in Scorpio, also forming a Kite formation with South Node – Lasting several days. On December 05 at 21:52, the Moon joins in with a conjunction with Mercury. December 04 to 11 we have a conjunction by declination between the Sun, Saturn, Pluto and the asteroid Vesta. On the 9th, the Moon reaches it’s southern peak by declination also. This could be very significant. December 01 at 02:12: Venus in Libra at 29°09′ opposite Uranus in Aries. December 01 at 11:24: Retrograde Mercury leaves Sagittarius and re-enters Scorpio. 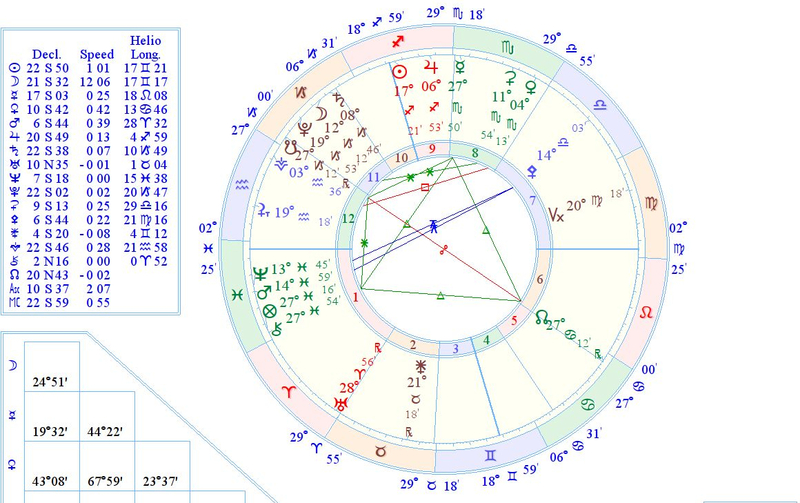 December 02 at 10:15: Mercury Retrograde in Scorpio at 29°07′ quincunx Uranus in Aries. December 02 at 17:01: Venus leaves Libra and enters Scorpio. December 03 at 00:34: Sun in Sagittarius at 10°47′ square Mars in Pisces. December 04, around midday, Grand Trine in Water signs: Mercury retrograde in Scorpio at 27°47′, trine Chiron retrograde in Pisces at 27°55′, trine North Node retrograde in Cancer at 27°44′. December 05 at 22:21: Sun in Sagittarius at 13°44′ square Neptune in Pisces. December 07 at 14:11: Mars in Pisces at 13°44′ conjunct Neptune. December 11 at 11:37: Mercury in Scorpio at 28°54′ quincunx retrograde Uranus in Aries. December 12 at 23:42: Mercury leaves Scorpio and enters Saggitarius. December 14 at 01:18: Ceres in Scorpio at 13°48′ trine Neptune in Pisces. December 16 at 14:26: Venus in Scorpio at 09°34′ sextile Saturn in Capricorn. December 17 at 06:57: Mars in Pisces at 20°07′ sextile Pluto in Capricorn. December 20 at 16:21: Sun in Sagittarius at 28°44′ trine retrograde Uranus in Aries. December 21 at 17:11: Venus in Scorpio at 13°54′ trine Neptune in Pisces. December 21 at 17:36: Mercury in Sagittarius at 09°35′ conjunct Jupiter. December 21 at 22:22: Sun leaves Sagittarius and enters Capricorn. December 25 at 00:31: Mercury in Sagittarius at 13°57′ square Neptune in Pisces. December 27 at 15:05: Venus in Scorpio at 19°17′ conjunct Ceres. December 28 at 21:30: Venus in Scorpio at 20°29′ sextile Pluto in Capricorn. December 30 at 20:38: Ceres in Scorpio at 20°33′ sextile Pluto in Capricorn. Browse through the menu above to find your area of interest, and we hope you enjoy your stay. Click Here to browse our pages of over Fifteen thousand Celebrities and Events. Full graphical natal charts of thousands of famous people, events and places. Here at Astrolreport, we produce high quality astrological reports; Natal Reports, Horoscope Forecasts, Relocation Reports and more. These reports can be emailed to you within 24 hours from placing your order. You will receive a Free graphical chart wheel with every report purchased. Go to the Chart Shop for more information.